The Dartford Loop Line opened on 1st September 1866, but this station was a later addition to the route, not coming into use until 1st April 1878. Known from the outset as ‘’Pope Street’’, after the farmland which surrounded it, the architecture employed here was typically conforming to the SER’s ‘’economical’’ policy. Nevertheless, the station was also delightfully elaborate, its intricate canopies and wrought-iron platform lamps evoking the quintessential ethos of the Victorian era. As per usual with stations along the route, two platform faces were evident, the ‘’up’’ side surface being host to the main building. Single-storey and with a pitched roof, it was based on the same design as those earlier examples at Crayford, Bexley and Sidcup, and like these, also came with a complement of ‘’satellite’’ clapboard offices on either side (see Hildenborough). However, by 1878, the SER had abandoned the flat-roofed canopy design which had been standard on this route and, at Pope Street, employed a seemingly more pleasing arched roof type. Indeed, an arched design prevailed at Sidcup in 1887, when the ‘’up’’ side was rebuilt and, in 1873, Pope Street’s canopies were replicated at St Johns, right down to the valance pattern (which is still in existence at the latter). The ‘’down’’ side at Pope Street was equally well protected from the elements, it also comprising a curved canopy of identical dimensions to that on the ‘’up’’ side. Indeed, there was no station building on this platform, but the canopy was instead backed by clapboard, with wraparound edges. Change was swift and as early as 1st January 1886, the station officially became known as ‘’New Eltham’’, with ‘’Pope Street’’ being relegated to a suffix on the name board. The redevelopment of land into housing had spread southwards from Eltham, the Pope Street area being rechristened as a new extension of the former. It is likely that the lattice footbridge came into use at this time, superseding the existing track foot crossings. The site, located within a cutting, was restrictive, thus goods provision was by no means extensive. A yard was situated on the ‘’up’’ side: this consisted a pair of westward-facing sidings, some 215 yards in length, one of which terminated at a dock platform. Controlling this layout was a SER-designed all-timber signal box, two storeys high and situated just beyond the western end of the ‘’down’’ platform (as will later be discovered, this cabin had a premature ending). The suffix ‘’Pope Street’’ lasted nearly five years into the Southern Railway’s ownership of the station, being removed from the name boards in October 1927. Regular electric services via all North Kent routes had been running since 6th June of the previous year. The company had also taken it upon itself to replace the platform gas lamps with its own gas lamp design in 1926, but the original Victorian wrought-iron posts were retained - the SR had decreed that those stations on electrified lines should present a ''modern'' appearance. It was, however, under British Railways that the greatest site upheaval was to come, the characterful SER signal box seeing a premature end. 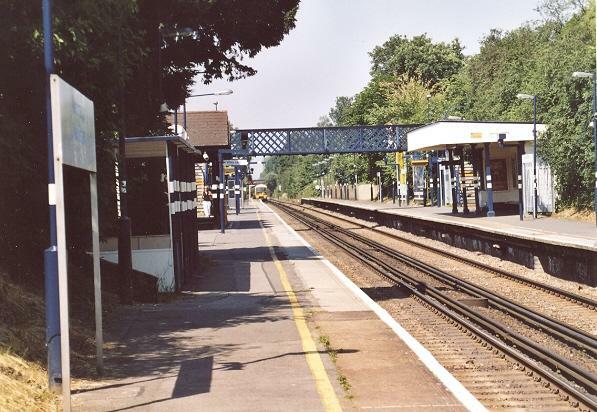 As mentioned within other sections concerning the Dartford Loop Line on this website, platforms were lengthened in 1955 with prefabricated concrete to accommodate ten car EPB formations. 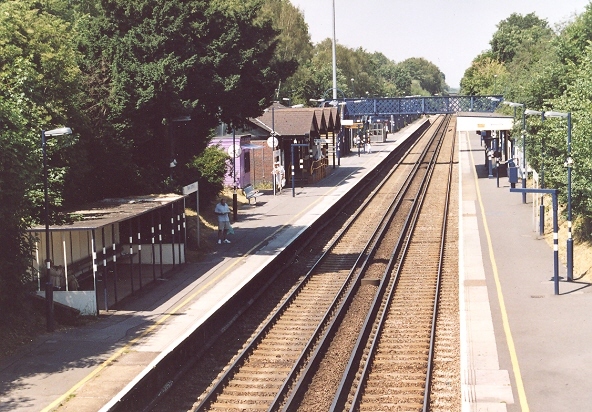 With a road bridge being situated at the eastern end of New Eltham’s platforms, the surfaces could therefore only be extended westwards. However, as mentioned earlier, the signal box was located on the ‘’down’’ side, at the western end of the platform. Consequently, the signal box was taken out of use on 15th May 1955, and swiftly demolished. 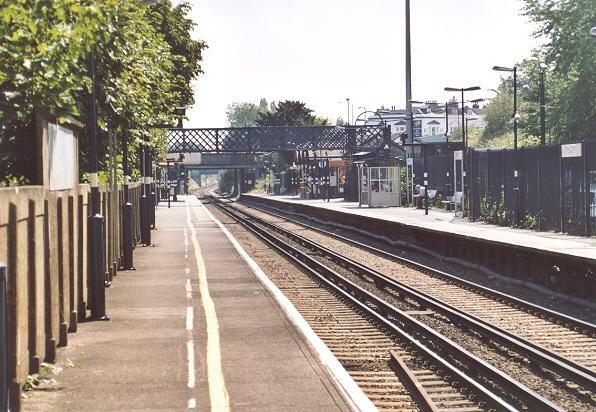 The ‘’dock’’ line was also taken out of use at this time, but one siding remained, this being electrically released by Sidcup’s cabin until goods traffic was totally withdrawn exactly eight years later. In 1965, both ‘’up’’ and ‘’down’’ sides saw their canopies rebuilt to a simpler design (which had occurred concurrently at Northfleet, and a decade earlier at Gravesend Central), and three years later, a pair of bus shelters appeared at the eastern end of the ‘’up’’ platform. Semaphore signals succumbed when colour light signalling came into use on 1st November 1970, this being followed shortly afterwards by the replacement of the SR’s concrete bracket lampposts with metal equivalents. The clapboard at New Eltham survived the many demolitions of the 1960s / 1970s in favour of CLASP, but the late 1980s heralded a new cull of SER architecture. In 1988, the main ‘’up’’ side building was demolished and in its place, a brown-brick structure erected. One storey high and with four gabled roof pitches on its northern elevation, this was at least a decided step up from the abominations of twenty years earlier. Nevertheless, SER presence was maintained in the form of the lattice footbridge and the ‘’down’’ side shelter (despite the latter having a 1965 valance). One of the 1968 bus shelters on the ‘’up’’ side was demolished in 1990, but more recently, in 2005, an additional shelter appeared on the same platform, just to the west of the footbridge.